Longevity is a multi-media content platform based on health, wellness and positive aging therapies from all over the world. Our mantra is to help you live better, live smarter and happier as you age. In South Africa, Longevity is available in a high quality printed magazine and digital format and online at www.longevitylive.com. The company also hosts regular health, wellness events and retreats. While the publishing operation for Longevity has been based in South Africa, Www.Longevitylive.com has attracted a global audience over the years. 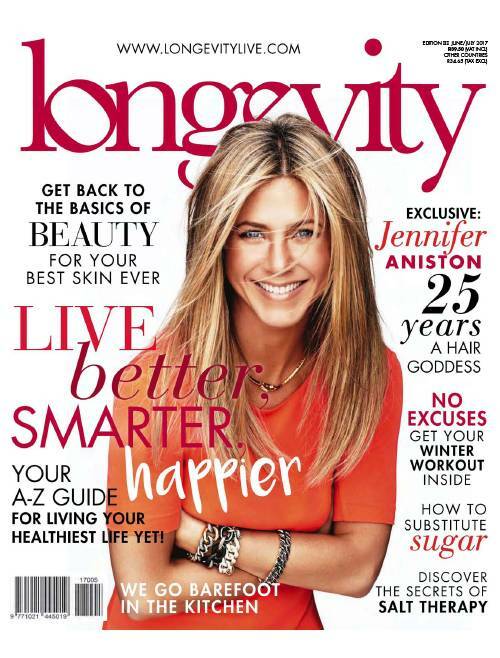 Longevity was first launched in the United States of America, in magazine format back in 1989 by Kathy Keeton. She was born and raised on a farmin South Africa and met her future husband Bob Guccione in London. ­ They moved to the United States where she helped him to build a multi-million-dollar business empire. Kathy was appointed President and Chief Operating Officer of General Media Communications, Inc. She founded the magazines Viva (1973), Omni (1978), and Longevity (1989 in the USA). She also wrote two non-fiction books, Woman of Tomorrow (1986) and Longevity: The Science of Staying Young (1992). Longevity was launched in South Africa in 1993. Sadly, Kathy was diagnosed with breast cancer during this time. Despite her trailblazing experimental cancer treatment, she died in 1997 from other complications during surgery. Gisele is a well-respected media professional in her own right and a self-professed health activist. Readers can interact with her (@giselewaymes) as well as the Longevity brand on many different platforms. Online and through social media on Facebook on Twitter @longevitymag and Instagram @Longevity-Live and attend regular health events. Longevity has been recognised over the years for its balanced reporting and publishing excellence. The team were awarded the industry’s most coveted magazine award programme – PICA – for best consumer Health magazine. The team have been involved in many related health initiatives, including the media sponsorship of the World Congress on Healthy Aging which took place in South Africa in 2015 and the launch of the WellUp Challenge, a nine month virtual weight loss and wellness programme. In 2017, Longevity launched #BarefootintheKitchen a multi-media healthy eating series as well as #ActiveForLife, a social responsibility project with PEISA.co.za. Longevity also enjoyed a television presence when it hosted 15 Minutes with Longevity on CNBC Africa. “Longevity is about not merely to slow down the aging process, but to help people of all ages lead useful, happy and more active lives.” “If you want a longer, more active life, the time to start is now. It doesn’t matter if you are 18, 28, 48 or 80. The earlier you start redesigning your lifestyle to increase your lifespan, the better. “– Kathy Keeton, founder of Longevity magazine USA.